This holiday villa is located in a quiet area, a 5 minute drive from the bustling center of Ibiza and 10 minutes from the beach of Playa den Bossa. The villa overlooks the beautiful sea. The villa consists of a spacious living room and a modern kitchen. Through the living room you can walk onto the terrace, where you'll find a large dining table where you can eat all together, enjoying the view. Inside there is a wonderful jacuzzi, treating you to a marvelous view of southern Ibiza. 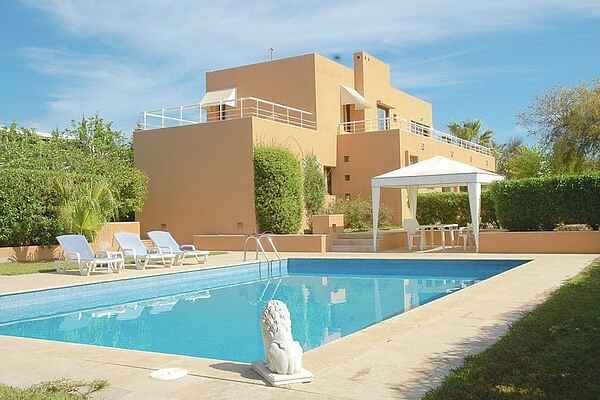 There is also a large garden with private pool at your disposal. Ibiza is known for its beautiful nature with beautiful pine forests, steep cliffs and sandy beaches. It's not surprising that over 40% of Ibiza is officially recognized as a nature reserve. Enjoy all of this nature in the morning and have a delightful walk (10 minutes) to get delicious fresh baked bread. Ibiza is also known for its vibrant nightlife with famous clubs. In addition to entertainment opportunities, the city offers a fascinating ancient walled district, D'Alt Vila, where you can stroll through winding streets, alleys and staircases with a beautiful view of the city and harbour.